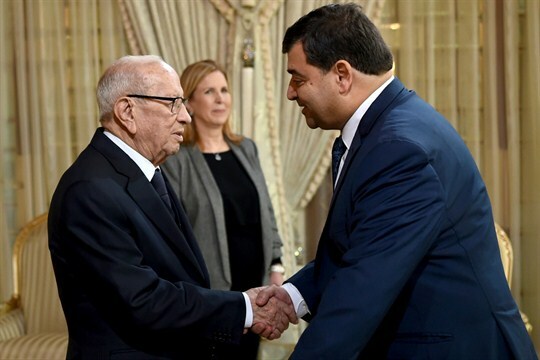 New Tunisian tourism minister Rene Trabelsi, right, and Tunisian President Beji Caid Essebsi in Tunis, Nov. 14, 2018 (AP photo by Hassene Dridi). Tunisia’s prime minister, Youssef Chahed, announced several changes to his Cabinet last week in a bid to shore up support for his government amid a parallel political and economic crisis. The changes were approved in a parliamentary vote that the ruling Nidaa Tounes party boycotted, laying bare the deepening divisions within the Tunisian government. In an email interview with WPR, Sharan Grewal, a post-doctoral research fellow at the Brookings Institution’s Center for Middle East Policy, discusses the latest developments in Tunis and what to expect from the newly approved Cabinet.